On June 11, Juno began transmitting to and receiving data from Earth around the clock. This constant contact will keep the mission team informed on any developments with their spacecraft within tens of minutes of it occurring. On June 20, the protective cover that shields Juno’s main engine from micrometeorites and interstellar dust was opened, and the software program that will command the spacecraft through the all-important rocket burn was uplinked. One of the important near-term events remaining on Juno’s pre-burn itinerary is the pressurization of its propulsion system on June 28. The following day, all instrumentation not geared toward the successful insertion of Juno into orbit around Jupiter on July 4 will be turned off. The mission optical camera, JunoCam, imaged Jupiter on June 21, 2016, at a distance of 6.8 million miles (10.9 million kilometers) from the gas giant. In the image, just to the right of center is Jupiter, with its distinctive swirling bands of orange, brown and white. To the left of Jupiter (from right to left) are the planet’s four largest moons — Europa, Io, Callisto and Ganymede. Juno is approaching over Jupiter’s north pole, affording the spacecraft a unique perspective on the Jovian system. Previous missions that imaged Jupiter on approach saw the system from much lower latitudes, closer to the planet’s equator. JunoCam is an outreach instrument — its inclusion in this mission of exploration was to allow the public to come along for the ride with Juno. JunoCam’s optics were designed to acquire high-resolution views of Jupiter’s poles while the spacecraft is flying much closer to the planet. Juno will be getting closer to the cloud tops of the planet than any mission before it, and the image resolution of the massive gas giant will be the best ever taken by a spacecraft. All of Juno’s instruments, including JunoCam, are scheduled to be turned back on approximately two days after achieving orbit. JunoCam images are expected to be returned from the spacecraft for processing and release to the public starting in late August or early September. “This image is the start of something great,” said Bolton. 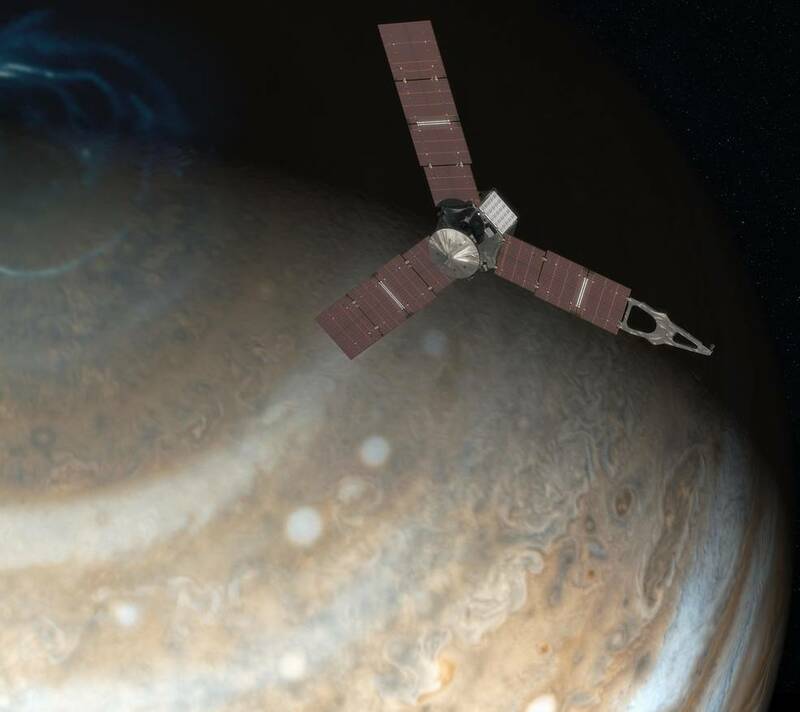 “In the future we will see Jupiter’s polar auroras from a new perspective. 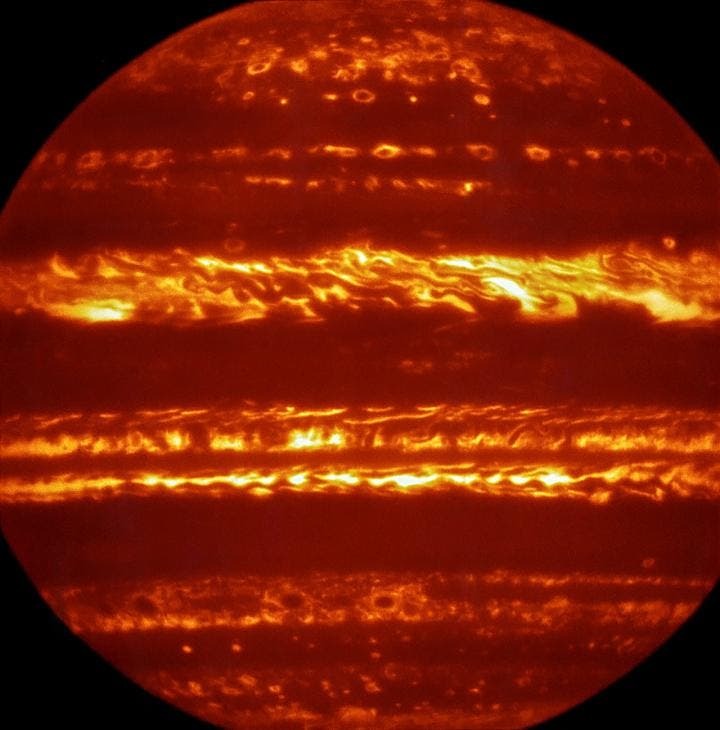 We will see details in rolling bands of orange and white clouds like never before, and even the Great Red Spot. Fletcher and his team have also used the TEXES spectrograph on NASA’s Infrared Telescope Facility (IRTF) in Hawaii regularly to map Jupiter’s changing appearance. The team made observations at many different wavelengths, optimised for different features and cloud layers in Jupiter’s atmosphere, to create the first global spectral maps of Jupiter taken from Earth. “These maps will help set the scene for what Juno will witness in the coming months. We have seen new weather phenomena that have been active on Jupiter throughout 2016. Both sets of observations were made as part of a campaign using several telescopes in Hawaii and Chile, as well as contributions from amateur astronomers around the world, to understand Jupiter’s climate ahead of Juno’s arrival. The ground-based campaign in support of Juno is led by Dr Glenn Orton of NASA’s Jet Propulsion Laboratory. Once in orbit around Jupiter, Juno will skim just 5000 km above Jupiter’s clouds once a fortnight – too close to provide global coverage in a single image. The Earth-based observations supplement the suite of advanced instrumentation on the Juno spacecraft, filling in the gaps in Juno’s spectral coverage and providing the wider global and temporal context to Juno’s close-in observations.